The Book Chook: Can Books Be Our Friends? Can Books Be Our Friends? Parents are more aware than ever that children's books need to be kid friendly. Statistics about reading levels and motivation in young people are daunting. 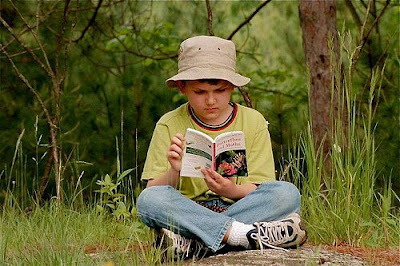 Boys in particular can be reluctant to read, especially when presented with high ability/low interest books. After any child has "failed" at reading, is it any wonder he or she shuns it? What does kid friendly really mean? To me, it means simply that the writer has told a great story, with believable characters and lots of twists and turns to keep kids interested. Some internet sites have been set up specifically to present such books. Check out James Patterson's ReadKiddoRead.com and Jon Scieszka's Guys Read site. But the best person to consult about kid friendly books is your child himself. If we want our kids to enjoy reading, we need to give them access to material they want to read. Checking a book to see if it has won a literary prize is probably not the best way to filter books. Rather, let your child choose, and make sure she has plenty of books to choose from. Go to the library together and research appealing subject matter, or try the old-fashioned approach and browse. Check out book reviews in the kidlitosphere until you find a book that sounds as if it could be your child's new friend. Rummage through market stalls and read a couple of pages together before making your choice. Sure, kids will make some inappropriate choices. I knew many youngsters who demanded Harry Potter books when their reading ability just wasn't ready. I like to think they grew into those books just like hand-me-down jeans. The more we choose, the better we get at choosing. Books can be our friends. If someone's bashing you up for your lunch money, reading about a bully getting his come-uppance is even better than sticking pins in dolls. When you suspect the cute kid on the bus thinks you're a dork, distract yourself with a tale of dragons and dwarves. Those nights when you're convinced nobody understands you, escape to a place where you walk in your favourite character's shoes. And the very best thing about books? They stay our friends for life. Hey there; great post! Books are my friend! I gave you an award...see my post Blog Worth Watching that I posted yesterday. It's the one I marked here as recent. I really like this post, too. Excellent advice all around. Books have certainly been my friends for life, and they've repaid me for my loyalty time and time again. Thanks for these words! Great post as usual! Books make trrific friends as well as a lasting expression from young to old. Thanks. Thanks Shelly! I made a sacred vow never to do memes but I so thank you for the thought! I agree, Jen. Loyal AND portable makes for an unbeatable combination! Very insightful post, Susan. I agree, books can be our friends, but it's important to choose them wisely and to always consider the individual. I also agree that awards can be deceiving, and should not always be the basis for your selection. And finally, we tend to check out loads of books and then pay attention to what clicks for them. We then use this newly-formed wisdom to guide us in our next selections. It's a constantly evolving process. Just a quick note, I'm always amazed how some parents limit their children's library selections to one or two books. I see it all the time, the child wants to get another book and the parent scolds them and says, "You've got one, that's enough." What harm could one or two, or even a dozen more books do? (the answer-none!) The more the merrier, we think. Thanks for your thoughts, and have a nice day. Absolutely, Phredude! I always over-borrow. Can't always judge a book by its cover and a quick skim, so when I do start a book, I might find it and me just don't get along. But there are millions more out there. I think we should max up our library cards and revel in books! Really enjoyed what you had to say about books. My daughter loves her books, of which she has a ton. She always tries to get one more story out of me at bedtime. You can never have too many books. Yep, Jo, I know all about that "just one more" routine! But I just love to hear about young ones who love to read. Thanks for visiting!